FileTime enables you to manage your firm's case service contacts without going through a case filing process. You can also view counsel's eService contacts prior to submitting a filing for the case using the following process. After logging into your firm account, you will be, by default, on the Cases page (B below). By default, FileTime displays for you only your own cases (C above). You can click the drop down arrow to select to view all of your firm's cases or all the cases your firm has archived. Find the case for which wan to view or manage the service contact list. Click the + icon (D) to open the display tabs for that case. Click the Service Contacts tab (E). 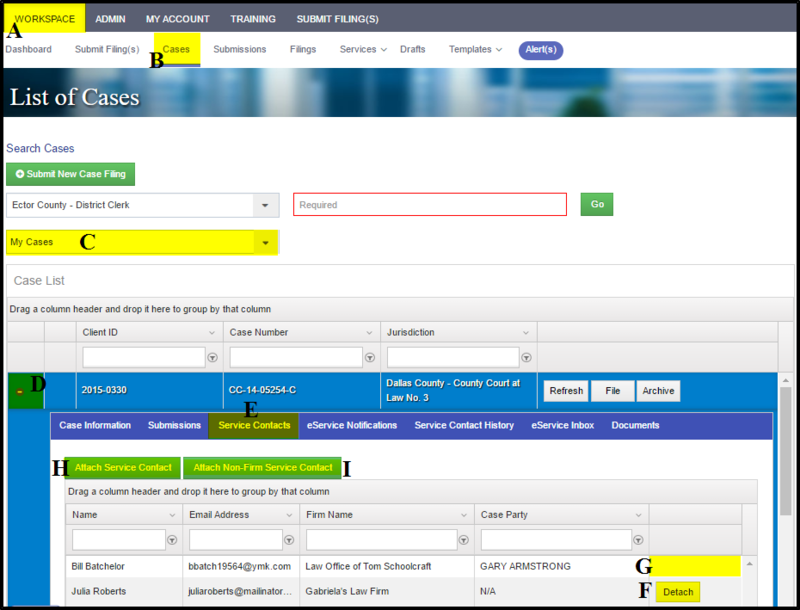 eFileTexas only allows you to delete your firm's service contacts so any of your firm's service contacts that you have assigned to the case will show the Detach button (F) in the actions column. Any case service contacts for counsel will be blank in the actions column (G). Click the Attach Service Contact button (H) to attach a service contact for your firm to this case. Click the Attach Non-Firm Service Contact button (I) to attach counsel who: (1) is not already opted in as a service contact for the case, (2) cannot be found on the eFileTexas Public Service Contact List, and (3) for whom you have an email address.